Skip over to Amazon and snag your free copy of Christmas Treasures today, just in time for holiday reading! I won’t be posting any more of the novel until after the first of the year. In the meantime, I’ll be posting holiday fun! 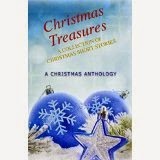 Let’s start with an exciting new anthology: Christmas Treasures. Mystery, intrigue, romance, and historic Christmases. And all just a few pages long. The perfect book for the…uh…resting room, where moms have to hide in order to read anything. Pour bubbles in the tub and sink back with lovely holiday stories. Don’t miss Christmas Treasures in print or on your Kindle.